On February 10th 2016, RunningBrooke awarded $70,000 to twelve non-profits in Alexandria benefiting 1,755 at-risk children. This year, funding priority was given to non-profits who use exercise and physical activity to boost learning. To send 10 at-risk kids for a week-long summer camp with community police officers. To fund hour-long yoga classes twice a week for job readiness program participants. One of the most noticeable changes is the apprentice’s attitude about taking yoga! With most of our apprentices being male, their first response to attending twice weekly was skeptical. Within a very short period of time, they were all looking forward to their time at the yoga studio. All of our apprentices have improved dramatically in their flexibility, body awareness, physical confidence and overall attention to health and self-care. To provide preschool classes incorporating movement for low-income families and families of the working poor. …families are struggling to overcome a variety of challenges including financial, legal, health, or family issues. For children of these families, physical activity is especially important for starting on a path toward health and success. To fund Learn & Play Groups to strengthen families at-risk for child abuse incorporating movement and free play. …supported a variety of physical activities as part of our school year based Learn & Play Group program. Every weekly unit in our specialized curriculum features a “Play to Move” segment where we integrate physical activity and motion to reinforce learning…. For shape learning, we tape shapes on the floor around the room, then parents and children hop, skip, and jump among them following the facilitator’s directions and examples. To provide health and wellness program for children attending free, bilingual, preschool classes. When Gary* first came to CFNC, he struggled with nine motor skills and coordination in almost everything he touched. He couldn’t hold scissors well, was underdeveloped in his physical education on the playground, and struggled in everyday normal activities in the classroom. Gary’s teachers noticed that the more he played ball and other sports with his classmates on the playground, the more coordinated he became with simple tasks such as cutting paper with scissors, holding a pencil, drawing, and writing his own name. Because of his physical activity on the playground, Gary no longer struggles with these tasks, as his fine motor skills have improved significantly. To provide an exercise program and after school tutoring for children in the Arlandria and Brent Place Communities. It was a rainy spring in Alexandria, but students in Community Lodgings learned how to stay active and engaged no matter what the weather or other limitations. We loved hearing stories about how students took what they learned and told their parents and siblings and were able to do similar activities and talk about heath with their entire families. To fund a nature journalism class learning about science through art combined with hiking. … we’ve engaged an Art-Science intern with a dedicated mission of injecting movement and art into our summer camp, weekend, children’s services and homeschooling programs. Funding also provided field art kits that are given to participants in camps and weekend sketch classes that they are allowed to keep. We have found that many low income people, and entire families, will sign up for these classes together, if they are made affordable. To provide scholarships and after-school classes, teaching positive body image and self-esteem while training for a 5K. 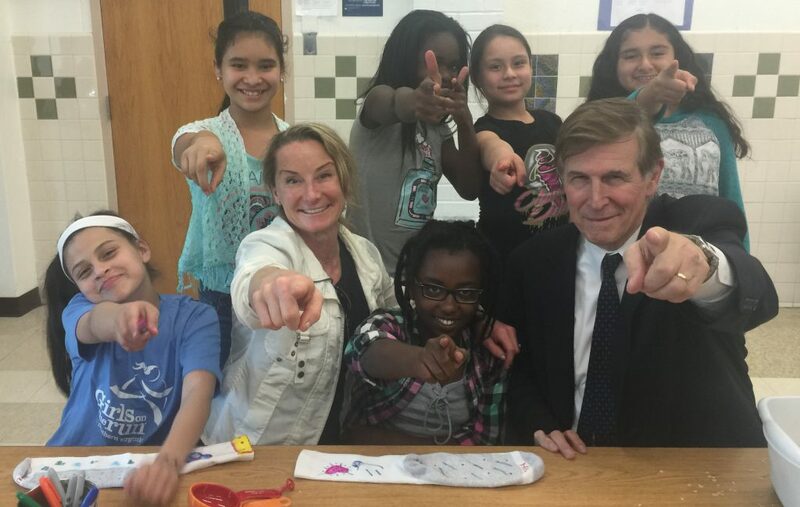 Congressman Don Beyer joined our RunningBrooke site visit to the Girls on the Run Team at an Alexandria elementary school. GOTR Girls start their practices with warm up exercises and stretching. They then have a discussion about a topic related to emotional, social, or physical health, and then participate in running games that reinforce the lesson. Girls are encouraged to compete only against themselves while always encouraging one another. To provide after school dance workshops for children living in affordable housing. The goal is to gain a greater level of physical fitness while exploring creativity. Self-expression and communication are explored in movement games. Active exercise increases self-awareness strength, balance, flexibility and coordination. Cooperative interaction helps students to find ways to work together with others, a skill very important for school project and for any life stage. To fund soccer and tango lessons, teamwork and respect at Samuel Tucker Elementary school. Our fourteen students and five teachers represented the following countries: Argentina, Italy, Puerto Rico, El Salvador, Ghana, Ethiopia, Trinidad/Tobago, China, Bangladesh, Sierra Leone, the Philippines, Peru, and the USA. Our student with learning and emotional issues was also with us last year. In class, his soccer skills and willingness to follow instructions were greatly improved. Our program is not about accomplishment, but about the process of accomplishment, about giving students tools to tackle problems (including class behavior) and create strategies for success. Sequential learning, performance skills, and self-confidence is key. One parent at Jefferson Houston has commented directly that yoga has been life changing for her child. The tools she learns in yoga have carried over outside of class and help her to focus and manage her energy!